Don't know if any of you speak Chinese and know about this, but my jaw almost dropped on the floor when I saw this for the first time. 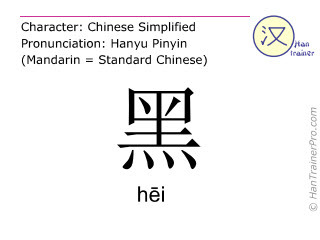 There is a chinese character, which looks quite interesting. And it's not only how it looks, but also what it means too. It means black/dark/sinister. I think this is one of the most amazing co-incidences I've ever come across, at least as a B5 fan. Take a look and tell me what does it resemble from B5? I'm pretty good at the Rorschach inkblot tests but I'm drawing a blank here. :-/ That said, I fail at seeing 3D objects in those noisy images too. Heh I must admit it took me a minute, but now I get it! Definitely a weird coincidence! I've been doing a lot of independent study of Chinese characters (kanji though, the Japanese usage) myself. I didn't get what you meant at first, but eventually I figured it out. I guess it kind of resembles a Shadow. Indeed it does, doesn't it. I tought about Shadows right away when I saw it for the first time. I think it's an amazing co-incidence considering also its meaning. The Universe is a strange place. Sweedish meatballs all over the universe.